with prohibits disability discrimination in the workplace. Having a “disability” that is protected under the law has been specifically defined for these circumstances. A person with a defined “disability” is someone who has a physical or mental impairment that substantially limits one or more major life activities, has a record of such impairment or is “regarded as” having such an impairment by the employer. Some types of conditions are considered per se disabilities, such as cancer, HIV/AIDS, diabetes and epilepsy. The law provides that an employer may not discriminate against a person with a disability and it also provides that an employer must make a “reasonable accommodation” for a disability unless that accommodation causes an “undue hardship” (significant difficulty or expense to the employer). What is “reasonable” depends upon the circumstances, but your employer is required to engage in an interactive process to decide the best solution for accommodation. That might include providing certain equipment, such as a special phone for a deaf employee. It might include a modified work schedule, additional training or even intermittent leave. It could even include reassignment to another position if that position is vacant. 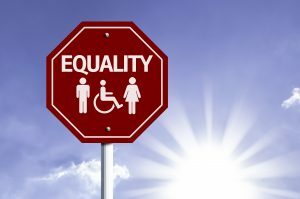 When Does Disability Discrimination Occur? Disability discrimination also occurs when an employer treats a job applicant less favorably because he/she has a history of a disability (such as cancer that is in remission). While the ADA doesn’t require an employer to accommodate an employee who must care for a disabled family member, the Family and Medical Leave Act (FMLA) may require an employer to do so. Employers may not retaliate against any employee who claims disability discrimination or seeks an accommodation of a disability. Punishing someone for standing up for their disability rights is against the law. What is a Loved One is Disabled? The law also protects people from discrimination based on their relationship with a person with a disability, even if they themselves do not have a disability, such as an employee whose husband has a disability. The ADA goes beyond protecting against discrimination and retaliation for disabilities. It provides that an employer may not ask job applicants about medical information or require a physical examination prior to offering an applicant the job. After a job is offered, an employer can only ask for a medical examination if it is required of all employees holding the same or similar job. If the employer turns you down for a job after a medical examination, it must prove that it is physically impossible for you to perform the work required. Texas state law is very similar to the ADA and provides the same protections. U.S. Equal Employment Opportunity Commission guidelines proscribe an ‘interactive process’ as part of reasonable accommodation. As the term implies, this requires interacting with disabled workers to customize job accommodations. These criteria may vary for similar or even identical basic job descriptions that depend heavily on highway situational factors such as work setting or frequency of various required tasks. This phase entails joint efforts by bosses and workers to evaluate duties and specific limitations in relation to particular individuals’ job performance. Review should address environmental factors as well as job tasks that present special challenges. Management should strive to devise sets of multiple accommodations with real potential to mitigate performance barriers in work environment and required job tasks. Besides facilitating better informed decision making, actively engaging affected worker(s) enables possible alternative backups and agile adjustment for unforeseen changes. After identifying viable accommodations, organizations should regularly reevaluate actual effectiveness and individual workers’ preferences to determine if preferred accommodations would impose undue hardship on the organization. For more details about interactive process requirements, visit the EEOC’s website here. If you have been victimized by job discrimination due to disability or any other illegal basis, take steps toward full legal vindication of your rights today. Arrange a free initial consultation with an experienced Fort Worth, Texas labor lawyer by calling Hutchison & Stoy, PLLC, at 817-820-0100 now or fill out a free case evaluation online.